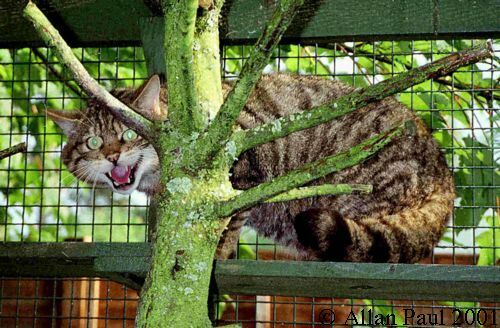 There is still a distinct Scottish population of wildcats, dispelling fears that interbreeding with domestic cats has fatally compromised the wildcat's independent existence in Scotland, says British geneticists in a recent article in New Scientist. The European wildcat (Felis silvestris silvestris) lives in woodland all over Europe, but in Britain it only survives in Scotland. The domestic cat is descended from the African wildcat (Felis silvestris lybica). African and European wildcats diverged from their common ancestor more than 20,000 years ago. To study the effect of interbreeding, Mark Beaumont of the University of Reading and his colleagues analyzed the genetic fingerprints of wild Scottish cats and domestic cats from England and Scotland. They found that although there are many hybrid cats living in the wild, there is a genetically distinct group of wildcats that haven't interbred recently with domestic cats. Gamekeepers in the 19th persecuted Scottish wildcats and early 20th centuries and nearly became extinct. Male wildcats wander around looking for a mate, and when females are scarce they breed with feral domestic cats. Despite this, the wildcat survives as distinct species. There are now about 3500 living in the Highlands of Scotland. Wildcats are now protected, but convicting people who kill them depends on proving that the victim was a wildcat, and not a hybrid or a feral tabby. It takes an expert to tell them apart. The new work shows that their genetic fingerprints can reliably identify wildcats.